The most damaging foliar disease of pyrethrum in Australia is ray blight caused by Stagonosporopsis tanaceti. The probability of growers incurring economic losses caused by this disease has been substantially reduced by the implementation of a prophylactically applied spring fungicide program. This has been traditionally initiated when 50% of the stems have reached between 5 and 10 cm in height. Data collected on the emergence of stems from semidormant plants over late winter from 27 fields across northern Tasmania from 2009 to 2011 were used to develop a degree-day model to assist with initiation of the fungicide program. Temporal changes in cumulative proportion of plants with elongated stems were well described by a logistic growth model (R2 ≥ 0.97 across all fields). These models were used to calculate the number of days until 50% of the sampling units had at least one elongated stem for the calculation of simple degree-days, assuming a nominal biofix date of the austral winter solstice. The median date for 50% stem elongation was estimated as 30 August in these data sets. Mean error and root mean square error of degree-day models were minimized when a base of 0°C was selected. Mixed-model analysis found prediction errors to be significantly affected by geographic region, requiring the use of scalar correction factors for specific production regions. In the Western region, 50% stem emergence was predicted at 590.3 degree-days (mean prediction error = 0.7 days), compared with 644.6 (mean prediction error = 7.7 days) in the Coastal region and 684.7 (mean prediction error = 0.7 days) degree-days in the Inland region. The importance of fungicide timing for initiation of the spring disease management program in minimizing losses (expressed as percent disease control in October) was also quantified. This relationship was best explained by a split-line regression with a significant break-point of 513.8 degree-days, which corresponded to 10.7% of sampling units with elongated stems. 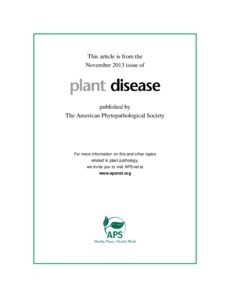 Overall, this research indicated that disease management may be improved by applying the first fungicide of the program substantially earlier in phenological development of the stems than currently recommended.